There will definitely come a time that you as a homeowner will have to do partial reroofing or roof repair. However, in cases where the roof is quite older and has been missing significant numbers of shingles in multiple areas, it would be best to entertain the idea of complete or total roof replacement. 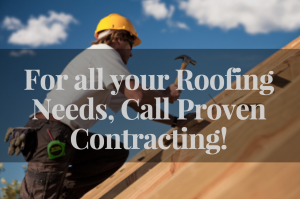 Before Proven Contracting performs any roofing job such as roof replacement, we always see to it that homeowners are prepared with such undertaking. To share with you our preparation tips, we have put together below some of the things that you should do before and during the roof replacement process. After you have hired a roofing contractor that suits your budget and need, you should also cater to the physical needs of these experts. This would mean that you should see to it that your roof easily accessible. See to it that before roofers place their heavy equipment near your roofs, such as ladder and other materials, your cars, trash cans, and other objects should not be blocking their way. If you want a much faster resolution, try to clear the area outside your home or even inside it of any physical obstruction that will make their work less efficient. If you want to reduce the chances of your landscapes being damaged during the process of roof replacement, see to it that you have marked the fragile landscape areas in your property. This may include but not limited to lawn decorations, sprinkler head, avoid shrubs, trees, and other features. By giving your roofing contractor a heads up on what to avoid, you may be able to mitigate any potential damages to your outdoor aesthetics. As indicated above, a roof replacement will not only be happening outside your home. That is why you should make sure that the internal areas of your home are free from obstructions such as stored or boxed items in the attic, furniture, wall arts, and other fragile decorative accessories. With Proven Contracting we always see to it that potential liabilities are removed from the working area before we start working, this will ensure that safety of the home contents and our confidence in working inside your home. Since complete roof replacement will take a great portion of your time, it would be better to make an advance planning for your kids and their pets. As much as possible, you should keep your pets and kids away from the worksite to avoid accidents and potential delays. Try to condition your kids about the potential noise that comes along with the reroofing project. For your pets, try to put them on a leash if possible while work on your roof is going on. Here at Proven Contracting, we understand the importance of a reroofing project for you and your family. That is why we always strive to have an efficient and budget-friendly service to help you resolve any roofing issues that you and your family might be experiencing. We are always open to your queries and request, simply contact us or visit any of our offices located in Bridgewater, Randolph & Long Valley in New Jersey.